I don’t know if any of you have been through a quarter- or mid-life crisis yet. I hope you never do. I, for one, am, hopefully, at the tail-end of mine. I think it started when it finally began to sink in that I wasn’t “growing up” anymore. If you’re not growing up, then what are you? Growing old? This was a major shock to me. It was also a time that was eye-opening and made me realize that I wanted to make the most of my life. I have plenty of years left, still young, really – so if I wanted to make my life what I’ve always dreamed of, then I need to stop letting my fears get in the way and go for it! “To be honest, I was pretty scared going into the Yoga Teacher Training. I was convinced that everyone was going to be some super ‘Yogi’ and I was quickly going to fall behind. I ended up getting so much more out of it than just a 200hr YTT certificate. I think I had a bit of a quarter life crisis a few months ago. I literally quit my crazy busy, stressful 9 to 6+ job in Sydney, Australia and booked a flight to Toronto, Canada… alone. I needed to re- evaluate how I was living my life and the things I was prioritizing because something was just not working. I was just in survival mode. Yoga has always been a part of my adult life and I have always been drawn to how I feel when I’m on my mat. Be honest, you know the feeling I’m talking about. The one where you feel a bit more centered and in-tune with yourself, where all the craziness from the day seems to almost sort itself out for the hour. I had always wondered what it would be like to be able to teach yoga and help other people reach that feeling that I relied on so heavily, but the idea of doing the training and being venerable, in front of a whole class of people was just too scary. I must have mentioned this to friends and family a few more times then I realized. During my last week of living in Sydney, I spoke to my mom a lot. She had always wanted to do her gym instructing certificate and at the ago of 60, she did it… a very proud daughter moment! We got onto the topic of my move and what I wanted to do when I got to Toronto. I mentioned that I had looked into yoga training courses as something to do as a ‘side hustle’ to my regular career. My mom stopped me from talking and when on about how she can’t believe it took her so long to finally get the courage to finally get her certificate. It turns out she first went for it when I was a little bambino and again when I was in early high school. Every time, life just got in the way and it was easier to back out. So, in the last week of November, the night before I was getting on a flight to Canada, my mom and I hit send for the registration to the 200hr YTT in Costa Rica, on the 12th of January. I’m not sure if I was more scared or excited, but either way, I was going! The first 2 months in Canada flew by. Between getting aquatinted with the city, falling in love with my new city, Christmas and traveling, January came up really fast and I did not feel ready for the two week training! As I had been traveling so much and living out of the only suitcase I brought to Toronto, I barley had time to regularly get to yoga classes. I was so worried that the other students were going to be potentially snobby ‘yogis’ and I just wouldn’t fit in. Crystal, the lead trainer, had given me a call when I got into Canada to see how I was feeling about the trip as well as made a Facebook group with the other girls who were going. This did help to ease my nerves a bit but I was still just outright scared. The 12th of January came around and my carry-on suitcase, backpack, yoga mat and a very bundled up me (guys, its like -10°C in Toronto in January!) were off to Pearson Airpot for a 6am flight to +30°C Liberia, Costa Rica. After spending the first night in a hotel, early the next morning all the future yoga teachers were picked up by the owner of the retreat to take us there. Let me paint you a picture, 10 women who have know each other for all of a few hours at this stage, piling all of our bags into the back of a pick-up truck while we pile into a 10 seater van to embark on a bumpy 3hr drive to our own slice of jungle we were going to be calling home for the next 13 days. 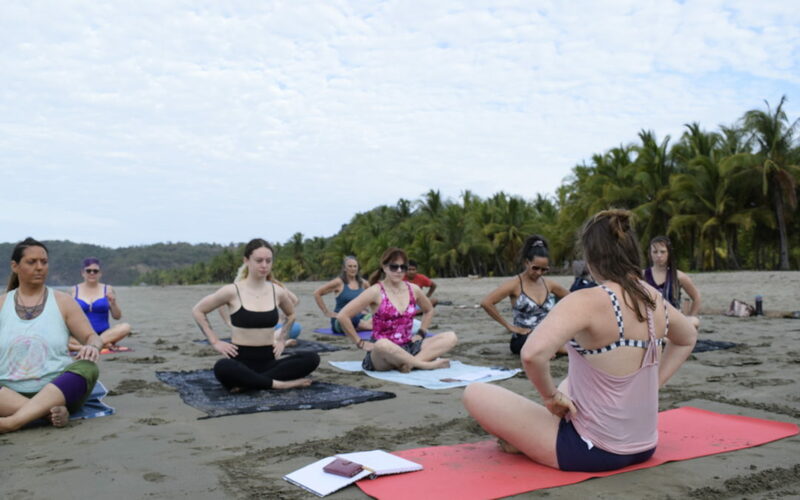 Every YTT retreat I looked into had a similar daily outline; wake up, self-meditate, coffee, yoga, breakfast, yoga theory, lunch, break, yoga theory, token non-yoga related activity (in our case the beach), dinner, bed. After doing this retreat, I believe it’s all the in-betweens and journeys you go through that makes this one so special. For me it was wake up before the sunrise on my own accord in my 2 bedroom, 2 bathroom, kitchen and living room, high-ceilinged, interior designer’s dream house which I shared with 3 other amazing girls (and a few cute little geckos), the walking along the dirt road to the communal dining area with my roommate, listening to the howler monkeys laughing in the nearby jungle while the pink from the morning’s sunrise was still in the sky. It was yoga in the shala overlooking the jungle and the ocean beyond. We’d catch glimpses of the monkeys swinging in the trees, butterflies fluttering in the morning sun and the distant sound of the waves. It was the yoga theory classes, expanding my knowledge and finding new interests. It was going to the beach before sunset and swimming in the waves carefree. It was practicing yoga poses with the sunset with the waves behind me and photographing these moments. It was the bonds I made with these women; these inspiring, loving, beautiful goddesses. I was able to create a tribe of amazing women, a family who are spread across North America, who had given me so much love and support over those 2 weeks and the continued love I feel since getting back to Toronto. Most of all, it was how I perceive me and my dreams and what I want. It has allowed me to experience that ‘yoga feel’ you get when you are on your mat, but off of it too. I’m so glad that other women are starting to wake up and not let their fears run their lives. It’s amazing to watch and an honor to be a part of their process. Many people think that a yoga teacher training is just about getting a “certificate”. That couldn’t be further from the truth. Besides a certificate, you get confidence, a voice, a path, and a sisterhood. All of these things are necessary to help you really rise up and start being who you’ve always dreamt of being. There are many paths but, I have to say, this is an awesome one. Crystal Gray is an international Yoga Teacher and author of the best selling book Goddesses Fart Too.